This year's 24 of Le Mans is almost here and is worth a little warming up for what it seems to be a very promising year. Last year's battle was one of the best ever, with an amazing battle between Peugeot and Audi. The french bidding on the new 908 and the germans trying to keep up their winning streak on the R18 TDI. Audi dominated for most of the 2000s and Peugeot started questioning them since 2007 managing a victory only in 2009. In 2010 Audi replied with a win and record distance of 5410.71km, more than 2000km more than Peugeot managed the year before. 2011's new regulations forced both companies to bring brand new cars to the grid, and Audi decided to change coach style from an open top barchetta to an enclosed cockpit of a more traditional LMP format. The race was on. 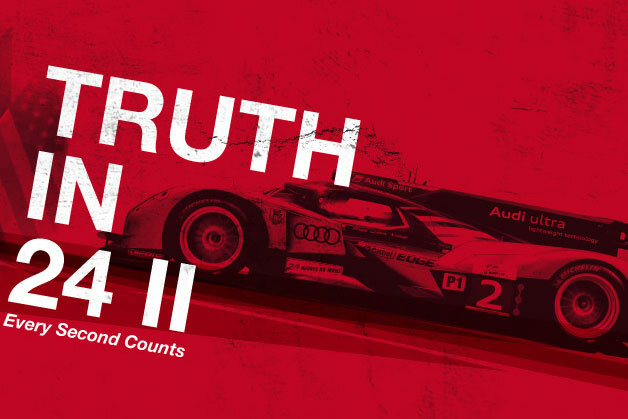 I would love to tell more about this amazing race but Audi of America for decided to produce and distribute for free an amazing documentary about this race. They have done it before for the equally amazing 2008 edition but decided to make it available in free streaming only for the american users. They haven't done the same mistake twice and "Truth in 24 II"has been available for download without charge and in HD on itunes from day one. I really recommend downloading it HERE. Some user made the first episode available in HD on youtube and AUDI did the same for the second one. I will attach both below. Do yourself a favour and watch them both while getting ready for Le Mans 2012 on the 16th of June. Peugeot will not be trying again but Toyota is back in the equation this year and we can be sure they will do anything possible to forget missing the target in 1998 and 1999. Will Audi keep winning? ps- don't forget to switch the HD on, go full screen, sit back and enjoy these amazing stories.